Gave a new direction to revolutionary movement in India, formed 'Naujavan Bharat Sabha' to spread the message of revolution in Punjab, formed 'Hindustan Samajvadi Prajatantra Sangha' along with Chandrasekhar Azad to establish a republic in India, assassinated police official Saunders to avenge the death of Lala Lajpat Rai, dropped bomb in Central Legislative Assembly along with Batukeshwar Dutt. Bhagat Singh was one of the most prominent faces of Indian freedom struggle. He was a revolutionary ahead of his times. By Revolution he meant that the present order of things, which is based on manifest injustice must change. Bhagat Singh studied the European revolutionary movement and was greatly attracted towards socialism. He realised that the overthrow of British rule should be accompanied by the socialist reconstruction of Indian society and for this political power must be seized by the workers. 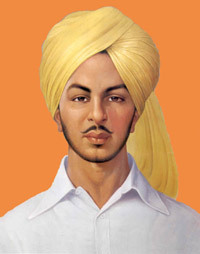 Though portrayed as a terrorist by the British, Sardar Bhagat Singh was critical of the individual terrorism which was prevalent among the revolutionary youth of his time and called for mass mobilization. Bhagat Singh gave a new direction to the revolutionary movement in India. He differed from his predecessors on two counts. Firstly, he accepted the logic of atheism and publicly proclaimed it. Secondly, until then revolutionaries had no conception of post-independence society. Their immediate goal was destruction of the British Empire and they had no inclination to work out a political alternative. Bhagat Singh, because of his interest in studying and his keen sense of history gave revolutionary movement a goal beyond the elimination of the British. A clarity of vision and determination of purpose distinguished Bhagat Singh from other leaders of the National Movement. He emerged as the only alternative to Gandhi and the Indian National Congress, especially for the youth. Bhagat Singh was born in a Sikh family in village Khatkar Kalan in Nawanshahar district of Punjab. The district has now been renamed as Shaheed Bhagat Singh Nagar in his memory. He was the third son of Sardar Kishan Singh and Vidyavati. Bhagat Singh's family was actively involved in freedom struggle. His father Kishan Singh and uncle Ajit Singh were members of Ghadr Party founded in the U.S to oust British rule from India. Family atmosphere had a great effect on the mind of young Bhagat Singh and patriotism flowed in his veins from childhood. While studying at the local D.A.V. School in Lahore, in 1916, young Bhagat Singh came into contact with some well-known political leaders like Lala Lajpat Rai and Ras Bihari Bose. Punjab was politically very charged in those days. In 1919, when Jalianwala Bagh massacre took place, Bhagat Singh was only 12 years old. The massacre deeply disturbed him. On the next day of massacre Bhagat Singh went to Jalianwala Bagh and collected soil from the spot and kept it as a memento for the rest of his life. The massacre strengthened his resolve to drive British out from India. In response to Mahatma Gandhi's call for non-cooperation against British rule in 1921, Bhagat Singh left his school and actively participated in the movement. In 1922, when Mahatma Gandhi suspended Non-cooperation movement against violence at Chauri-chaura in Gorakhpur, Bhagat was greatly disappointed. His faith in non violence weakened and he came to the conclusion that armed revolution was the only practical way of winning freedom. To continue his studies, Bhagat Singh joined the National College in Lahore, founded by Lala Lajpat Rai. At this college, which was a centre of revolutionary activities, he came into contact with revolutionaries such as Bhagwati Charan, Sukhdev and others. To avoid early marriage, Bhagat Singh ran away from home and went to Kanpur. Here, he came into contact with a revolutionary named Ganesh Shankar Vidyarthi, and learnt his first lessons as revolutionary. On hearing that his grandmother was ill, Bhagat Singh returned home. He continued his revolutionary activities from his village. He went to Lahore and formed a union of revolutionaries by name 'Naujavan Bharat Sabha'. He started spreading the message of revolution in Punjab. In 1928 he attended a meeting of revolutionaries in Delhi and came into contact with Chandrasekhar Azad. The two formed 'Hindustan Samajvadi Prajatantra Sangha'. Its aim was to establish a republic in India by means of an armed revolution. In February 1928, a committee from England, called Simon Commission visited India. The purpose of its visit was to decide how much freedom and responsibility could be given to the people of India. But there was no Indian on the committee. This angered Indians and they decided to boycott Simon Commission. While protesting against Simon Commission in Lahore, Lala Lajpat Rai was brutally Lathicharged and later on succumbed to injuries. Bhagat Singh was determined to avenge Lajpat Rai's death by shooting the British official responsible for the killing, Deputy Inspector General Scott. He shot down Assistant Superintendent Saunders instead, mistaking him for Scott. Bhagat Singh had to flee from Lahore to escape death punishment. Instead of finding the root cause of discontent of Indians, the British government took to more repressive measures. Under the Defense of India Act, it gave more power to the police to arrest persons to stop processions with suspicious movements and actions. The Act brought in the Central Legislative Assembly was defeated by one vote. Even then it was to be passed in the form of an ordinance in the "interest of the public." Bhagat Singh who was in hiding all this while, volunteered to throw a bomb in the Central Legislative Assembly where the meeting to pass the ordinance was being held. It was a carefully laid out plot, not to cause death or injury but to draw the attention of the government, that the modes of its suppression could no more be tolerated. It was decided that Bhagat Singh and Batukeshwar Dutt would court arrest after throwing the bomb. On April 8, 1929 Bhagat Singh and Batukeshwar Dutt threw bombs in the Central Assembly Hall while the Assembly was in session. The bombs did not hurt anyone. After throwing the bombs, Bhagat Singh and Batukeshwar Dutt, deliberately courted arrest by refusing to run away from the scene. During his trial, Bhagat Singh refused to employ any defence counsel. In jail, he went on hunger strike to protest the inhuman treatment of fellow-political prisoners by jail authorities. On October 7, 1930 Bhagat Singh, Sukh Dev and Raj Guru were awarded death sentence by a special tribunal. Despite great popular pressure and numerous appeals by political leaders of India, Bhagat Singh and his associates were hanged in the early hours of March 23, 1931.